Your wedding ceremony should feel as unique to you and your partner as any other part of the day. It’s important to advocate for those special touches with your officiant because it will make a significant difference between a cookie-cutter ceremony and a night to remember for the rest of your lives. Chuppah: There are many options to customizing your chuppah, specifically the cover. You can use a tallit that has been in the family for generations, the quilt your bubbe (grandmother) crocheted for your birthday, or you can have something significant printed on the covering. Perhaps a photo collage of friends and family, meaningful quotes, or even a symbol. My sister-in-law is of Chinese descent, and at her Jewish interfaith wedding to my brother, they printed a beautiful gold Chinese symbol on their chuppah cover that translated to “double happiness.” The chuppah represents the home you will build with your partner, so make it your own! Kiddush: You might be thinking, “Becky, it’s the kiddush, it’s a holy prayer and a cup of wine, why mess with it?” Well, I’m glad you asked. When Femi and I met with our officiant, we asked her about the significance of the prayer and why it’s included in a typical Jewish wedding ceremony. She told us it celebrates the sweetness of the occasion, which is a lovely sentiment. Femi jokingly says, “Could we do it with beer?” After we wiped away tears of laughter from the amazing joke, our officiant said, “Honestly, you can use whatever you want.” Our eyes lit up! We happen to have a favorite beverage as a couple (because we’re that cute), and that will be the special beverage we will use for our kiddush at the wedding. Here are some ideas and alternative liturgies for this time. Vows: While a traditional Jewish wedding does not have vows, you may want an opportunity to exchange meaningful words with your spouse-to-be. Besides the obvious idea of writing your own vows, there are traditional Jewish words that you could use at your wedding when you exchange rings. If you’ve been to a Jewish wedding you’ve probably heard “I am my beloved’s and my beloved is mine.” It’s beautiful, but not set in stone. If you and your partner have a meaningful phrase that has significance in your lives as a couple, use it! Seven Blessings: The seven blessings are a highly customizable section of the wedding ceremony. IFF has a page describing not only their meaning and significance, but also alternatives to the traditional blessings. Don’t be afraid to go even further! Have readings from seven Shakespearean sonnets. Ask the guests to join you in singing the chorus from your seven favorite songs. Choose married couples from your friends and family to share seven pieces of advice for a happy marriage. You have a lot of freedom here to make this section special. Breaking the Glass: While the physical action of breaking the glass is consistent across the board, the actual glass you break can have significance. If you have access to a local glassmaking shop, see if they offer classes for making your own glass. If you and your partner craft two different pieces, or even purchase two different pieces if a class is not an option (make sure you buy pieces that are thin enough to break easily during the ceremony), you could take them back to the shop or send them away to have a completely new piece made from the broken pieces to display at home. 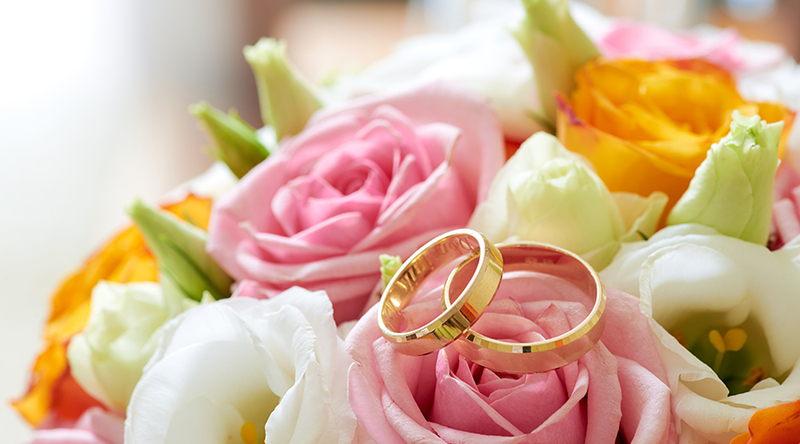 Cherish the time you and your partner spend crafting your wedding ceremony. You’ll be happy you did! If you’re looking for a Jewish wedding guide for your interfaith ceremony, we’ve got one here for you! I’d love to hear some ways you’ve customized your ceremony—let me know by leaving a comment below. And if you’re looking for more information on planning a Jewish interfaith wedding, InterfaithFamily has lots of resources here.